Beautiful sea chart depicting the entrance to the Coquille River in Oregon. Reconnaissance of Entrance and Part of Coquille River Oregon. 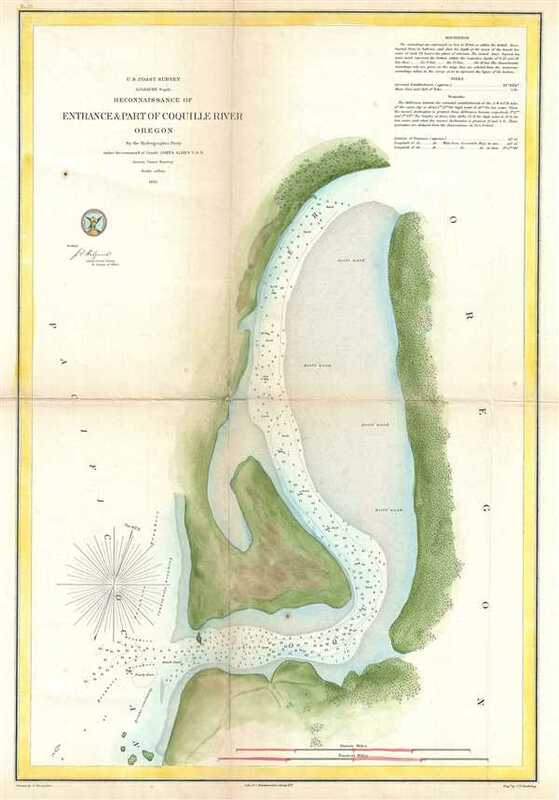 This is a beautiful 1861 U.S. Coast Survey chart or map of the entrance and part of the Coquille River in Oregon. It covers the entrance of the stream as it empties into the Pacific Ocean. The chart shows incredible inland detail in terms of topography as well as several coastal features, including areas with quicksand, bars, drift wood, etc. Includes numerous depth soundings throughout. The chart also includes notes on tides, soundings and other important information helpful to the mariner. Hydrography for this chart was conducted by a party under the command of Comdr. James Alden. The whole was compiled under the direction of A. D. Bache, Superintendent of the Survey of the Coast of the United States and one of the most influential American cartographers of the 19th century. Very good. Minor wear and toning along original fold lines. Minor foxing. Professionally flattened and backed with archival tissue.